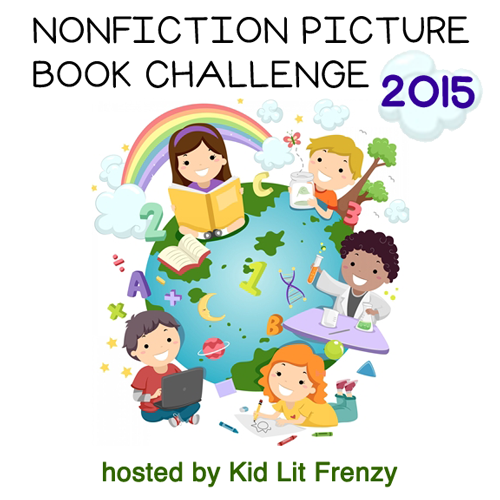 Time to share on Wednesdays with Alyson Beecher's Non-Fiction Picture Book Challenge at her blog, Kidlit Frenzy. Thanks to those who shared the following books so I could know about them and find them at my library. They are all special. It’s hard to believe that the animals we know as cuddly stuffed-animal hippos are shown in this book to be the most dangerous in the jungle. Easily also the largest, except for elephants, they can weigh as much as four tons, can bite an alligator in half, can run and swim faster than a human. 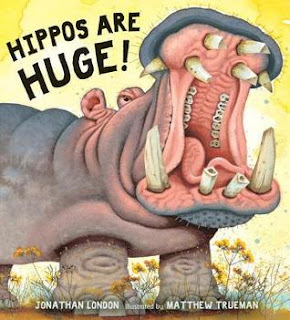 Trueman’s illustrations fill the pages, demonstrating the hugeness of hippopotamuses, now designated as “vulnerable” on the endangered list. London’s “big” words give basic ideas while his smaller text expands the information. Anyone who has interest in these largest of our mammals will enjoy and learn. For instance, I didn’t know that hippos really don’t swim, they simply “dance”, kicking off from the bottom of a river or lake, gliding, then kicking off again. 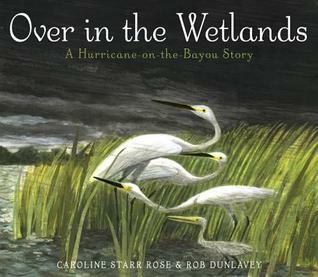 It would be a joy to introduce the concept of “wetlands” with this beautiful book by Caroline Starr Rose and Rob Dunlavey. In words and pictures, the story takes us on a journey of introducing a wetlands by seeing a dragonfly, crabs, brown pelicans and spoonbills, and alligators, all residents, all doing their “jobs” like eating, caring for their babies, and nesting in different places. As hints of a hurricane come--“Angry clouds are gathering low./Water churns in the undertow.”--the same animals and others, like egrets hiding in cattails, take the cover they can. The flashing light early, and the darkening pages illustrate the dreadful storm on its way. The brief text is poetry, and the illustrations accompany in moody color, from sunlit to cloud and rain dark. There is a further explanation of wetlands and the need to keep them, and a bit more about each animal featured. This particular story focuses on the Louisiana bayous. My daughter needs this book. She just told me that she’s trying to be a good model for the girls, so when they found a spider in a pot outside, she remained calm, just looking, until the older daughter picked it up and let it start crawling up her arm-squish! This is the method for Bethany Barton, telling quite a few ‘spidery’ things, and at first, no matter how interesting, “squish”. Slowly she manages to discover that spiders help the world a lot; one way is by eating lots of unwanted insects. The illustrations are rather like a journal, with large text and good examples drawn in clever and colorful ways. It will be a good start for those who would like to “like” spiders, or those who would like to start studying them. Barton’s clever, strong and amusing voice makes me want to read it aloud to a group, too. I think it will be good to read aloud, Earl. You'll have to read it & let me know what you think. Enjoy! 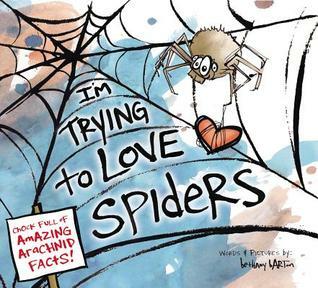 I think it might take even more than this picture book to help get me over my fear of spiders, but it sure is a cute one! :) We just did a celebration of "creepy critters" at my library, this would be a good addition to the booklist. It is new, Jane, & certainly will be a great one to add. Hope it helps you, too! I just got Over in the Wetlands in the mail. I ordered a signed copy from Caroline herself and will be Skyping with her later this year. So cool to have such a beautiful picture book about our special place. It is very cool, I agree, Margaret. How wonderful that you'll be connecting too. 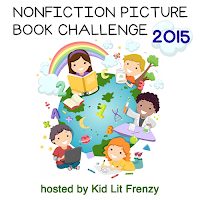 I enjoyed the book very much, words and illustrations! Guess we're really on the same page, Michele. As you can see, I loved each one. Happy Reading. What a great variety here Linda. I know the Spiders title and Hippos are Huge but I really want to read Over in the Wetlands. Your words here make me want to read it even more. I imagine you'll love it, Carrie. I saved Hippos to read to the grand-girls, know they will love knowing all about them. We do see several at our zoo once in a while.